Strategically situated in the warm, dry climate of Yuma, Arizona, the Marine Air Corps Station commands five square miles of Sonoran desert. This is the busiest air station in the Marine Corps and the second-busiest in the Navy. 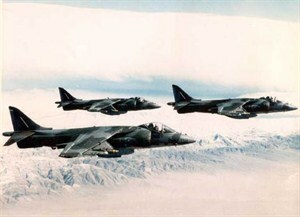 Its primary mission is to support aerial weapons training for the Atlantic and Pacific Fleet Marine Forces and Navy, and serve as a base for Marine Aviation Weapons and Tactics Squadron-1, Marine Aircraft Group-13 and other 3rd Marine Aircraft Wing units. Launched in 1928 as Fly Field, this exciting, technologically advanced facility played key roles in World War II and Desert Storm. Today, over 5,000 active duty marines and sailors, over 1,000 civilian employees and over 6,000 dependents live, work and play at the base, making it one of the top three economic contributors to the area. First Lieutenant/Public Affairs Officer W.G. Jimenez said that base housing consists of 821 units comprised of various styles and types that range in age from 12 to 35 years. 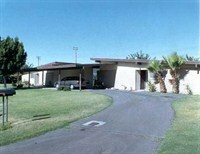 Most are frame and stucco townhouses with the living area on the first floor and bedrooms above. The two-bedroom units measure 1,100 square feet, the three-bedroom units measure 1,500 square feet and the four-bedroom units measure 1,400 square feet; all exceed minimum square foot living standards. The units feature individually-controlled HVAC systems for maximum comfort levels in the hot, dry desert environment of this extreme southwestern corner of Arizona. Within the individual units, both split and package systems are used with a rating of 11 S.E.E.R. (the Rheem brand is the newest) with gas being the sole energy source. DustEater Easy Flow is designed with Permatron’s exclusive Accumulator Chamber® which “stores” captured particles and effectively separates the media layers within two – 1/4″ frames positioned in a 1″ outer frame, to minimize face loading and maximize cleanability. Attracted to the media fibers in the direction of air flow, the particulates build up on the fibers without face loading. If an excess builds up (due to high concentrations in the air, or failure to regularly clean the filter) on the front panel (prefilter), they tend to break off, allowing air flow to sweep them into the Accumulator Chamber. Cross currents therein cause further agglomeration and some settlement until the filter is rinsed. Permatron’s innovative, exclusive product design avoids the common filtration method of stacking layers of media, a configuration which can certainly be effective, but may also exhibit key engineering disadvantages. Whereas the initial pressure drop is within acceptable levels, after a period of time, residual particulates can build up between the compressed layers. In this case, even a filter that has been properly cleaned may have developed an abnormally high pressure drop. DustEater Easy Flow has earned a Class 1 flammability classification from Underwriters Laboratories, Inc., a grade that is of particular importance to many commercial customers. In addition, it carries a lifetime warranty for long term satisfaction. No system modifications, electrical hookups or replacement parts are required for the use of this product. 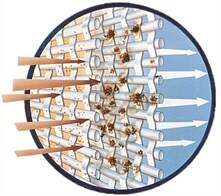 Since the filters are installed within individual housing units, tenants perform their own maintenance. This simply involves back-flushing the filter in the shower, dishwasher or sink. “When tenants move in,” explained Jordan, “they are instructed to wash the filter every 20 days.” To help ensure that this occurs, Permatron provided each tenant with a handy cleaning sticker. Permatron Corporation manufactures a variety of air filters for residential and commercial applications. The lineup includes the following types of filters, all of which meet the particular requirements of a given environment: electrostatic, activated carbon, zeolite, extended surface, prefilters, protective screens, flexible-edge filters and others. OEM products include filters for highly specialized industries such as telecommunications and transportation. In addition to distributing to the domestic market, Permatron exports to Canada, Mexico and overseas to Asia, Europe and South America. The company takes pride in its products, and has earned a solid long-term reputation for uncompromising excellence in the worldwide HVAC community.